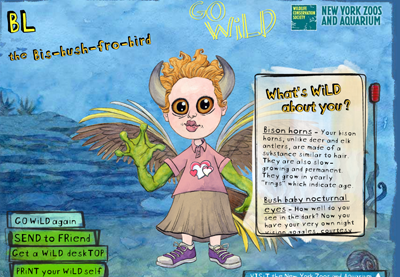 That’s the Wild BL I built at the New York Zoos and Aquarium Build Your Wild Self website where you can transform yourself into an animal, or combination of animals. The site also educates as you create, showing you facts about each animal as you add it to your wild Avatar. The final product can be emailed to a friend. Deutsch New York created the site. Aww cute!! It seems pretty educational too. It reminds me (maybe in a twisted kind of way)of a Gillette Venus’ campaign I saw once while listening to Pandora. It was called “Build your Manquarium”, where instead of wild creatures, you created your “ideal man avatar to swim around your screen and tell you the things you wanted to hear. Ok, so it’s sick but somehow it got me to try it and have “him” floating around for a while. I want one of those! You sure it’s not still around? Oh it is!! Google “Gillette Venus Manquarium”. tried manquarium, but the server crashed. and it was poorly done anyhow. Haha! Too bad. It’s sad how some companies just release a campaign, make it fun (at least it was for me) and then just let it die without cultivating it beyond the initial impression. That might be what happened to the manquarium. Very cool 6 months ago when I first tried it, but then what? Not even the server space to support it. Sorry you had that experience.